This segment of the tutorial introduces branches, particularly conditional branches and function calls. This is Part 3 of a series. If you haven't yet, you may wish to review at least Part 1 and Part 2. 1 Why do we need branches? 6.4.3 Using DECR to Spin "Forever"
Why do we need branches? The CPU, when it encounters this sequence of instructions, will always execute them in this order. That's useful by itself, but not useful enough to write interesting programs. That runs very fast, but it takes up a ton of ROM. Also, it clears the screen only once. What if you want to clear the screen many times throughout your program, perhaps from different places? You really don't want to copy this same code everywhere you need to clear the screen. That's where branches come in. 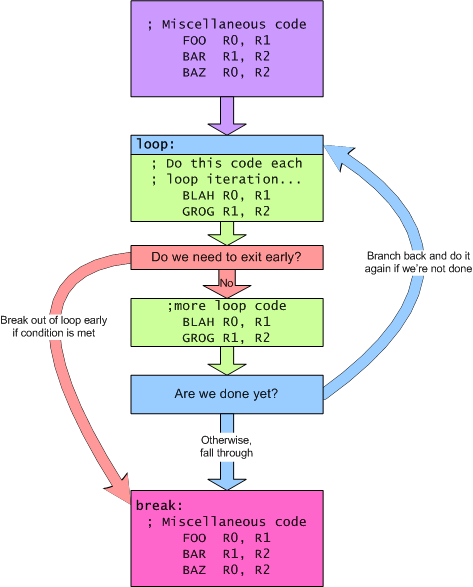 Branches tell the CPU to start executing at a different location, rather than barreling forward. Unconditional branches and jumps tell the CPU to always jump to that location. Conditional branches tell the CPU to jump to a new location if some condition is true. These let you skip pieces of code, or repeat them a number of times. Jumps to subroutine tell the CPU "go do this and come back when you're done." The following sections explore these concepts a little more closely. Most of the time, you will want to write your code in terms of branches to labels. This is far, far easier than trying to figure out the addresses of instructions you might wish to jump to. See the Assembly Syntax Overview for details on how to write labels. All of the examples in this tutorial will use branches and jumps to labels. Jump and Unconditional Branch instructions are like "goto" instructions found in higher-level languages. They tell the CPU to immediately start executing code from somewhere else as opposed to executing the next instruction in sequence. They're useful to tell the CPU to skip a section of code, or to repeat a section of code. Be careful when repeating a block of code with an unconditional branch: If there isn't a conditional branch somewhere in that block, it could end up running forever. As you can see, the primary difference between branches and jumps is that branches are smaller and faster. Branches encode their "target address," the address being jumped to, as a relative offset from the current address. Jumps, on the other hand, store the actual address of the target. In most cases, especially in a 16-bit ROM, there are few reasons to use a J instruction, although the combination instructions, JD and JE can be useful. There is also a pseudo-instruction, JR, that allows "jumping to a location held in a register." It is really a pseudonym for "MOVR Rx, R7". Because it is a MOVR instruction, it will modify the Sign Flag and Zero Flag, which may be confusing if you're not expecting it. Otherwise, it is an efficient method for jumping to an address held in an register, such as when returning from a CALL. Conditional branches are similar to "if ... goto" type constructs found in other languages. They tell the CPU to start executing at another location if a particular condition is true. This allows us to build "if-then-else" types of statements, as well as "for" and "while" loops. The CP1610 has a rich set of conditional branch instructions. 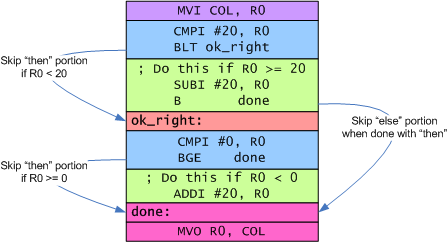 They work by looking at the CPU's flag bits to decide when to branch. Instructions like CMP and DECR set these flags, making it easy to write those if/else statements and for/while loops. Even fancier uses are possible with some creativity. The following table summarizes the conditional branches. Conditional branches are most often used with numeric comparisons, or as the branch at the end of a loop. The following sections illustrate how numeric comparisons, increment and decrement work in concert with branches. Conditional branches can also be paired with other instructions that manipulate the flags. For instance, shift instructions, as described in Part 4 update sign, zero, carry and overflow flags depending the operation performed. This can lead to interesting and creative combinations of shifts and branches. Another use of flags and branches is to pass status information in CPU flags (such as the Carry Flag) and then act on that information later. The SETC and CLRC instructions make it easy to manipulate the Carry Flag to pass this status information around. The following branches are particularly useful when comparing signed numbers. These are the conditional branches you will use most when writing "if-then-else" statements, since most numbers are signed, or can be treated as signed. Note: One pair of branches shown above—BOV and BNOV—are useful in this context only for detecting overflow and little else. I included them here for completeness. These actually find more use paired up with shift instructions. Those are described Part 4 of this tutorial. The next couple of paragraphs describe how these branches work with compares. Most of the time, you do not need to think about these details when writing programs, so feel free to skim it for now and come back to it later. That is, we can determine whether two numbers are equal or not by looking at the Zero Flag. We can determine if one's less than the other by looking at the Sign Flag. At least, that would be true if there was no such thing as overflow. The CP1610 can only work with 16 bits at a time. If you try to subtract two numbers whose values are very far apart, such as, in the worst case 32767 - (-32768), you will trigger an overflow, because the results don't fit in 16 bits. Overflow causes the sign of the result to be the opposite of what you would get if no overflow had occurred. The branches take this into account and look at the overflow bit in addition to the sign bit to decide whether one number is greater than or less than another. The following table illustrates the relationships both with and without overflow. As you can see, the flags and the branches cooperate quite nicely. BLT     label   ; Is this taken? This computes "R1 - R0", not "R0 - R1". It compares R0 to R1 by subtracting R0 from R1. In this example, that leaves S=0 and OV=0. 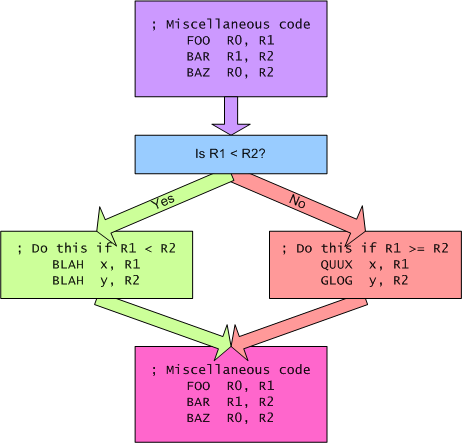 R1 is not less than R0, so the branch is not taken. In other words, to determine if a given branch is taken, you have to read right-to-left. "Is R1 less than R0?" In this case, the answer is no, so the branch is not taken. These branches are useful when comparing unsigned numbers. Most often, these get used with pointers into your game ROM, or with fixed point values such as screen coordinates. The unsigned comparisons require some additional explanation to be useful. After comparing two unsigned numbers, the BC instruction will branch if the second number is greater than or equal to the first. The BC instruction will branch if the second number is smaller than the first. The CP1610 does not offer unsigned equivalents for "branch if greater than" or "branch if less than or equal." You can get similar effects, though, by combining BC and BNC with BEQ or BNEQ to separate out the "equals", "greater-than" and "less-than" cases. The following couple of paragraphs explain how BC and BNC work in concert with other instructions to provide unsigned comparisons. Feel free to skim this for now and come back to it later. Unsigned arithmetic is actually pretty similar to signed arithmetic, except that there isn't a sign bit. Furthermore, it turns out that all the interesting information ends up in the carry bit. Read "How Signed Arithmetic Works With Conditional Branches" above to get the basics. As you can see, the carry flag gets set whenever 'x' is greater than or equal to 'y'. The carry flag is clear whenever 'x' is less than 'y'. This is why BC works as the equivalent of an unsigned "branch if greater than or equal," and BNC works as an unsigned version of "branch if less than." These will be explored in more detail in the "looping" section below. The if-then construct lets you say "Run this bit of code here only if this is true." The if-then-else construct is similar, with the added twist of letting you say "...or, run this other bit of code if it isn't true." As with the previous example, the code in the green box on the left runs when R1 is less than R2. The code in red box at the right runs when R1 is greater than or equal to R2. The CPU either executes one or the other. It doesn't execute both. So how does this look in assembly code? Again, the blue box holds the code that implements the "if". 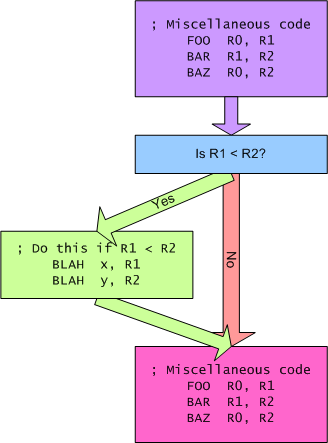 As with the previous example, the branch gets taken if R1 is greater than or equal to R2, thereby skipping the "then" portion of code. The branch now goes to the "else" code in the red box. The "then" code has an additional instruction: B done. What this does is skip the code for the "else" portion when the "then" portion is done. In either case, the CPU continues executing with the final block of code at the bottom. The above examples are somewhat abstract in nature. The following example is somewhat more concrete: Make sure COL stays in the range 0..19. This corresponds to the column coordinate in BACKTAB. If COL gets bigger than 19 (beyond the right edge of the screen), wrap around to the left edge by subtracting 20, else if COL gets smaller than 0, wrap around to the right edge by adding 20. The following example assumes COL is in 16-bit memory for now. CMPI #20, R0   ; Is COL >= 20? ok_right: CMPI #0,  R0   ; Is COL < 0? Notice that this code has both an if-then and an if-then-else. The first test, "COL >= 20" is part of an if-then-else. The "then" clause subtracts 20 from COL and then branches around the "else" clause. The "else" clause holds the second test, "COL < 0" as part of an if-then statement. That statement's "then" clause adds 20 to COL if it is indeed less than 0.
ok_right: TSTR R0        ; Is COL < 0? This is 2 cycles faster and 1 word shorter. Most of the time you won't notice the difference, but sometimes every cycle and every word counts. Loops tell the CPU to repeat a sequence of instructions some number of times. There are two main kinds of loops, traditionally referred to as for loops and while loops. 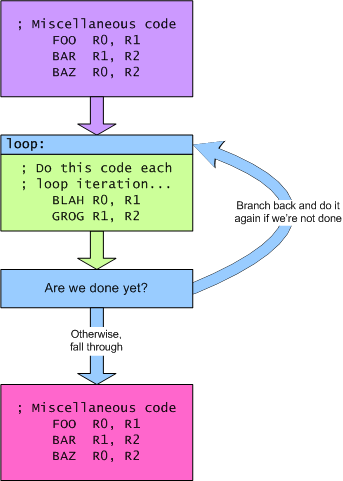 For loops know how many times they'll iterate before they start. 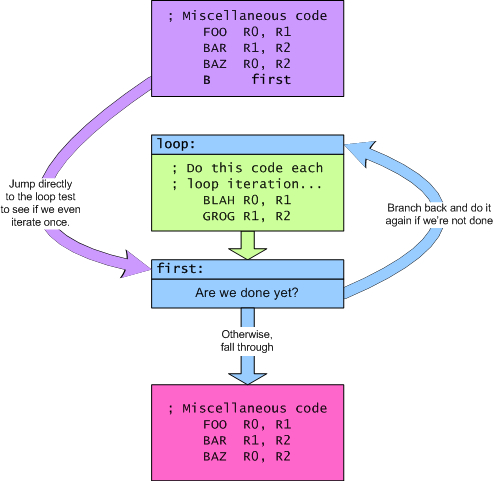 While loops figure out when to stop iterating based on something that happens during the loop. Clearing the screen is an example of a for loop: It will iterate 240 times, writing a 0 to each location of BACKTAB. Finding the length of a string is an example of a while loop: It iterates until it finds the NUL character at the end of the string. In assembly code, loops tend to have the structure shown below. This structure works for both for and while loops. The green part in the middle is called the "body" of the loop. The blue part is sometimes called the "loop test" or "loop condition." The difference between a for loop and a while loop is in the loop condition. While loops have more varied loop tests. What they look like depends on what the loop is trying to accomplish. "Searching" loops often look like this, breaking out of the loop when they find whatever it is they're searching for. Often, the branch that breaks out of the loop will branch somewhere other than the code immediately following the loop. This makes it easy to give different behavior based on whether the loop found the sought item or not. The example below illustrates this. MVII    #240,    R1   ; Use R1 as our "loop counter"
MVO@    R0,      R4   ; Write a blank to the screen. This code uses Indirect Mode accesses, as described in Part 1 of the tutorial. It uses R4 as the indirect pointer. R4 has the special property that its value increments after each indirect access. So, on the first iteration of the loop, the MVO@ R0, R4 instruction writes to location $200. On the second iteration, it writes to $201, and so on. Very handy. Is it NUL (0)? If so, we're done. Increment our string length and go back to step #2. Get the next character from the string. If it isn't NUL, go back to step #3. As with the previous example, this code uses Indirect Mode with R4 to step through a range of memory. This is one of the most common uses of R4 and R5. In this example, R4 will read the first character of the string on the first iteration, the second on the next, and so on. At the end of the loop, R4 will point one location beyond the NUL character that terminates the string and R0 will hold the length of the string. Exercise for the reader: How would you write this more efficiently? The following example comes directly from Space Patrol. The following loop looks for the first zero element in a table. The table is 5 elements long. If there is no non-zero element, it clears the carry flag and leaves. Otherwise, it proceeds to make a new bad guy by filling that slot in the table. PULR    PC                ;; Didn't find one, so leave. In this case, we have a for loop that iterates 5 times, but exits early if it finds an empty slot in the table. (SPAT1 stands for "SPrite Attribute Table 1") Furthermore, if it does exit early, it exits to a different path than if it makes 5 full iterations. This is a useful idiom for searching and finding. Each of the JSR instructions take two arguments: A register and a label (or address). The CPU puts the return address in the specified register and then jumps to the specified label. The return address is the address of the word following the JSR instruction. The CALL label instruction is a pseudonym for JSR R5, label. The additions to the code are minor. 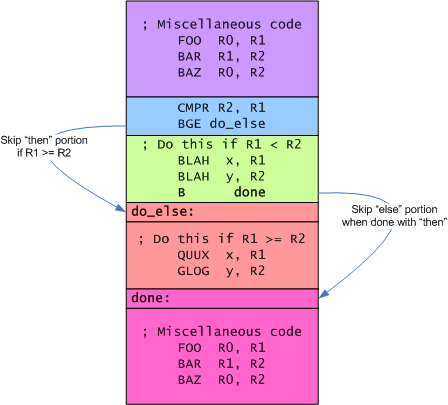 PROC and ENDP directives tell the assembler where the "procedure" begins and ends. This mainly provides a scope for local labels, such as @@loop in this example. The Assembly Syntax Overview describes these directives in a little more detail. The other main addition is the JR R5 instruction. What this does is return from the function back to the code that called it. How does this work? When calling this function with CALL CLRSCR (or JSR R5, CLRSCR), the CPU will copy the address of the instruction following the call into R5, and then branch to the function. The JR R5 instruction tells the CPU to jump back to that location, in effect returning from the called function. In the previous CLRSCR example, the function itself didn't take any inputs. (Inputs to functions are also referred to as arguments or parameters.) One way to pass arguments into a function is to set up the values in CPU registers. The caller and callee need to agree on the meaning of the various registers for this to work. 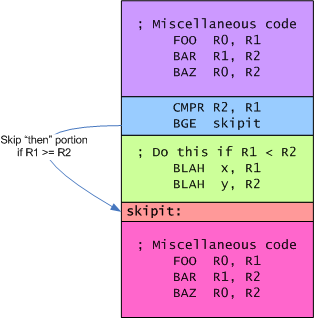 An example implementation of FILLMEM appears below. It expects the address of the location to fill In R4, the number of locations to fill in R1 and the value to fill in R0. 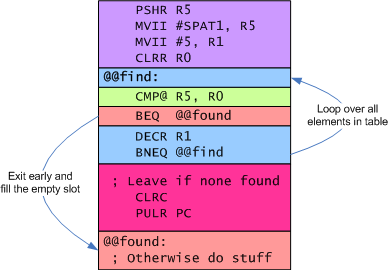 This is somewhat shorter than the CLRSCR code, mainly because the instructions that set up R0, R1 and R4 are omitted. FILLMEM expects the calling function to set these up. It's now possible to write CLRSCR in terms of a call to FILLMEM. This isn't the best way to write CLRSCR, but it is a useful example to illustrate the concepts. In many cases, the arguments to a function will be fixed for a given call of that function. For example, when your game prints "Game Over", it likely prints it at the same position every time, in the same color, and the text always reads "Game Over." Setting up these values—the position, format and pointer to the string—takes up a bit of code space. Each MVII instruction is 2 words long. That adds up quickly. Fortunately, the CP1610 makes it easy to pass static arguments as just plain data, without needing a block of MVII instructions before each call. If a particular function is going to get called regularly with certain arguments fixed at the call site as in the example above, then it makes sense to pass arguments via the return address. This relies on the fact that CALL sets R5 to point to the word just after the CALL instruction. If you put data here, then MVI@ R5 will read that data. The SDK-1600 PRINT function uses this technique to great effect. The following example shows a different version of FILLMEM and CLRSCR that mimic the example above. The difference is that this code passes arguments as data following the CALL instruction. JR      R5          ;  Jump to the code after the data we read above. For many library functions, such as PRINT, you may want to have multiple entry points into the same function that read a different number of arguments as data vs. expecting arguments in registers. The PRINT function linked above works this way, providing a high degree of flexibility in how it's called. The way this is accomplished is simple in many cases. You can put local labels on the various MVI@ R5 instructions at the top of the function, making it easy for callers to pick which parameters get read from after the CALL and which get passed in registers. Here's a modified version of FILLMEM. The local label @@vla denotes the entry point that will read "value", "length" and "address" as data after the CALL. This local label is known to other functions as FILLMEM.vla. The @@la entry point (aka FILLMEM.la) will read just "length" and "address" as data after the CALL. The value to fill needs to be set in R0. And so on. The @@r entry point (aka FILLMEM.r) expects all arguments to come in registers. As you can see, this technique provides a great deal of flexibility in how things are called. Sometimes, the last thing you do at the end of one function is call another. When that function returns, the only work left to do is to return again. While that works, it's often possible to "chain" the calls—that is, branch to the next function and let it return for you. Note that this is purely an optimization. If it is at all unclear to you, I recommend you steer clear of it unless you're in a crunch. Feel free to skip this section and come back to it if you need it later. Notice how this version of the code doesn't save the return address, and in fact doesn't do anything with it. Instead of using CALL to invoke CLRSCR, it merely branches to it. Since the return address for DLYCLR is already in R5, when CLRSCR completes and branches to it, it'll return to DLYCLR's caller. This is what "call chaining" is all about: In this case, CLRSCR returns on behalf of DLYCLR. Rather than having DLYCLR call CLRSCR, it instead branches—aka. chains—to it. It's not always possible to chain calls like this. In particular, if you pass arguments after your CALL instruction, as described in the previous section, you cannot chain to that call. As a pragmatic measure, I suggest avoiding call-chaining unless you need the stack space, code space or cycles that it saves. Write your code initially without it, and optimize later if you need it. Indirect branches are branches whose destination isn't encoded into the instruction itself. You've seen a special version of this above: The JR R5 and PULR PC sequences for returning from function calls are both forms of indirect branches. These sorts of branches are useful for many things. You can implement multi-way branches similar to C's switch/case construct (or BASIC's ON .. GOTO), or call-backs and so on. The following sections explore some of these uses. Jump vectors are locations in memory that hold addresses of functions to jump to. For example, when an interrupt occurs, the EXEC does a tiny bit of housekeeping (it saves the registers on the stack), and then it looks in locations $100-$101 for the address of an interrupt service routine to jump to. This allows the game to change what function handles interrupts to suit its needs, despite the fact that the interrupt is handled initially by the EXEC ROM. The following code illustrates how to set up the interrupt service vector. Since that vector is in 8-bit memory and program addresses are 16 bits, the vector occupies two locations. Other uses for jump vectors include setting up dispatch addresses for interesting events, such as receiving controller input, a timer expiring, or two objects colliding. Jumping via a vector is easy. The following code snippets show how to do this for addresses in 8-bit and 16-bit memory. Space Patrol uses a variation on this technique to manage the "bad guys." Instead of storing the address of the "thinker" associated with each bad guy, it instead stores a small integer index saying which thinker to call. A separate table expands that small integer into an actual thinker address. That blends the jump-vector idea with the next topic, jump tables. MVI     X,       R1    ; get the value of 'X'. Presumably it's 0..3. Sometimes, you'll run across a situation where the various places you're branching to are a fixed number of words apart. This next technique is a little tricky, but is very efficient for handling this case. The code subtracts the shift amount from 4, because a shift of 4 needs to skip 0 instructions, whereas a shift of 1 needs to skip 3 instructions. When you add to the program counter, as this example does, the value in the program counter at the time of the add is the address of the next instruction. This is why a value of 0 skips zero instructions. You can also use this technique in combination with branches as an alternate way of implementing a switch/case statement. This method is larger and slower than most other methods, though. It made more sense with 10-bit wide ROMs than with today's 16-bit wide ROMs. The following example shows the switch/case from the previous section rewritten to use this technique. Note that branch instructions are 2 words long. The example also shows a minor optimization: The highest numbered case can always be put right at the end of the list of branches, rather than having a branch to it there. The program counter, R7, can be accessed by almost any of the CPU's instructions. This leads to several cute tricks that border on being a bit too clever. Since these show up in actual code, it's worth at least explaining how they work. The instruction INCR PC adds 1 to the program counter. The net effect of this is skip the next word of code. If the next instruction is a 1 word instruction, this acts like a compact version of an unconditional branch. Why is this attractive? It is 1 word smaller and 2 cycles faster than a B instruction. It only works for skipping single-word instructions, and will modify the sign and zero flags, which may not be what you want. The instruction ADCR PC adds 1 to the program counter whenever the Carry Flag is 1. This amounts to a limited version of the BC instruction. This can come up in all sorts of situations. Take this code from Space Patrol for example. Here, the function BGMAKE returns with the Carry Flag set or clear based on whether there was room for another bad guy. (BG means Bad Guy. BGMAKE makes another Bad Guy.) If C==1, that means making the bad guy was successful, so there's additional work to do. If C==0, then there was no room for another bad guy. Here, the ADCR PC instruction skips the PULR PC instruction if BGMAKE successfully found a slot for a new bad guy. Using DECR to Spin "Forever"
Sometimes, your program will need to simply "sit and spin." This most often happens when trying to synchronize with an interrupt, say as part of an initialization sequence. (This will be covered in more detail in a future tutorial.) The DECR PC instruction decrements the program counter after executing the instruction. This puts the program counter right back at the same instruction, resulting in an infinite loop. The only thing that will break out of this infinite loop is an interrupt. MVO     R0,     $100    ; |_ Set interrupt service vector to point to "INIT"
Then, code at INIT can continue with initialization: Set up the STIC and GRAM, reset the stack pointer, and so on. Or, you can return to the Programming Tutorials index.